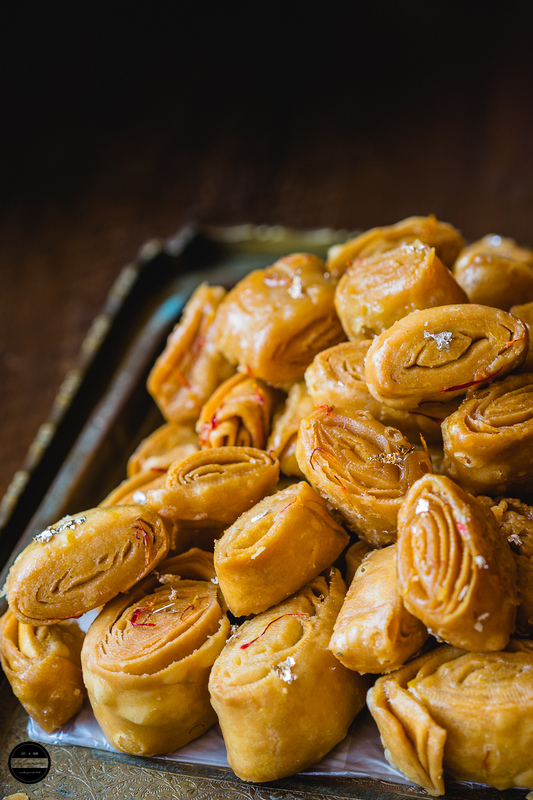 Kesar Khaja, is an Indian-style layered pastry soaked in Saffron Sugar Syrup. 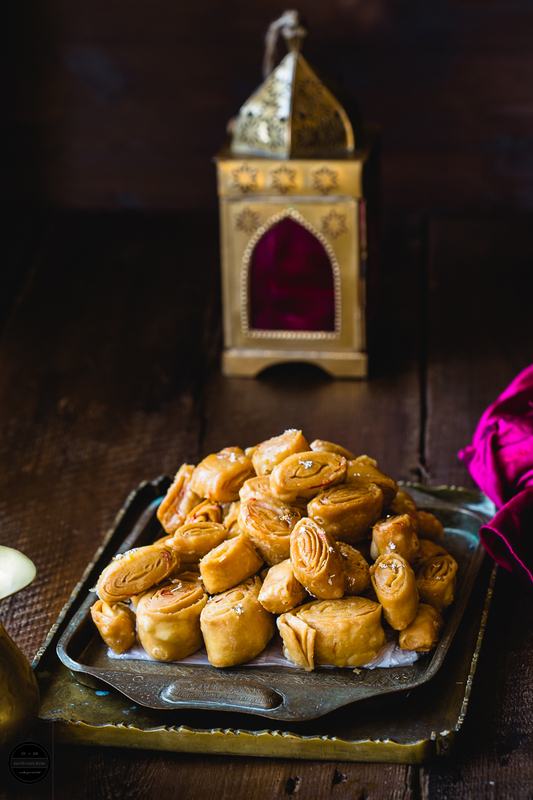 This crispy and flaky, scrumptious Indian sweet is prepared with Plain flour, splendid aromatic saffron sugar syrup and ghee and garnished with gold and silver edible leaf. Recently lovely folks from Mahbir sent me a few Mahbir Saffron products to sample. 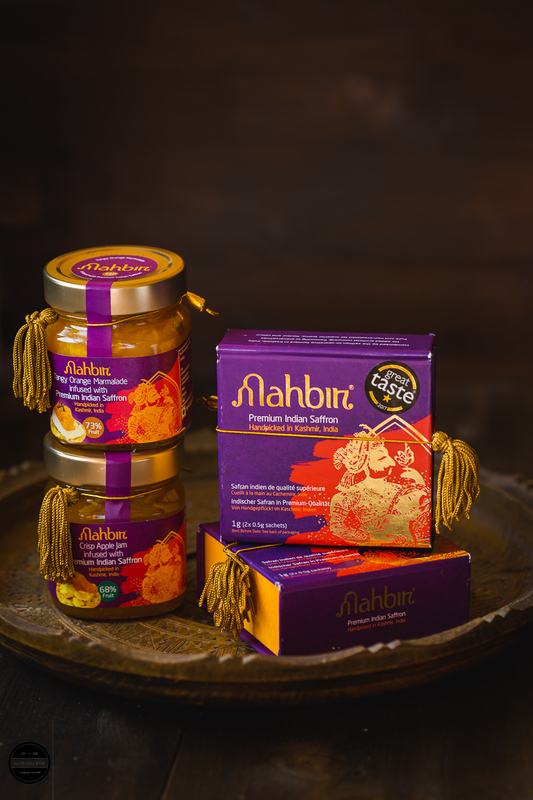 The box contained, Mahbir Crisp Apple Jam infused with Saffron, Tangy Orange Marmalade with Saffron and Mahbir premium Indian Saffron-India's most treasured Spice! Lovingly handpicked and harvested by farmers in Kashmir, India. Mahbir supports Kashmiri farmers in India, the products are fair trade. There were so many recipe options dancing in my head to try this Mahbir Saffron but since my children and family love to try out Indian authentic sweets, I choose to prepare Khaja! Khaja, favourite Indian sweet of mine since childhood, once a year our parents used to bring on the festival of Naag Panchami ( which comes around in August) Khaja, is a traditional and old age sweet dish of India and usually prepared during festival times such as Diwali, Holi or during a month of Ramadan and also offering as Prasad in many temples. Although Khaja is prepared all over India, every region has their own version of it and method of making various town to town and called with different names such as Chirote Khaja in Maharashtra (In Gujarat you can find round shape Chirote Khaja) where in South India you can find Madatha Khaja which are a diamond shape. Since this recipe was on to do my list for a long time, I grabbed an opportunity to make at home, but with Saffron. Usually, Khaja is made without saffron or any kind of nuts. This recipe turned out exceptionally well and the saffron flavours made it tastier and richer in taste and look. I prepared Khaja method two ways. You can make Khaja without saffron too. 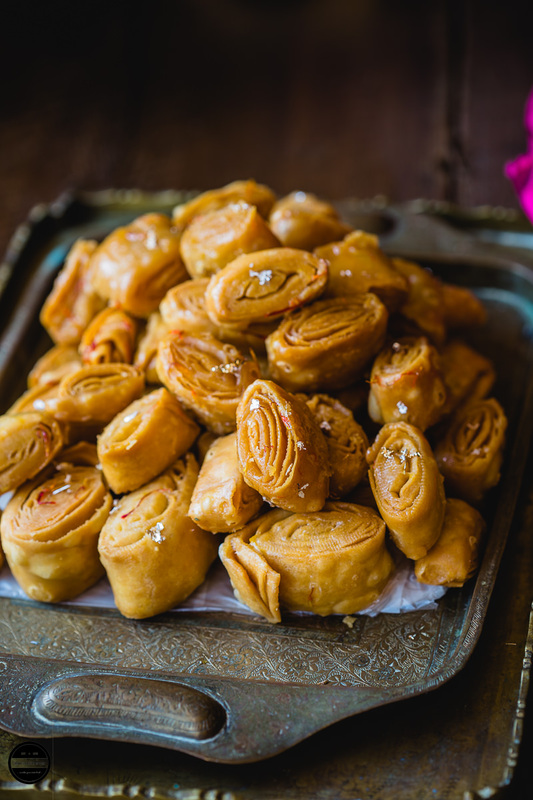 A delicious flaky traditional Indian sweet, multi-layer wraps prepared with Saffron and sugar syrup. In a big bowl add plain flour, ghee, salt and half of the saffron. Cover the dough with a clean wet kitchen towel for half an hour. Once again knead the dough for 2-3 minutes and divide the dough into two equal parts. Sprinkle corn flour all over it. Now start rolling it like a tight log, keep sprinkling a little cornflour in between. Then cut it into 1/2" pieces. Very lightly press the khaja pieces with your thumb or index finger. Meanwhile, heat the oil in a kadai. Keep the heat very low. Once all the khaja are fried, make sugar syrup. Place all the sugar syrup ingredients in a pan and let the sugar dissolve. Once sugar dissolved bring the syrup to boiling point then simmer until the syrup reaches one thread consistency. Then add fried khaja into the hot sugar syrup and let the syrup coat both the sides of khaja. Keep the khaja about 2-3 minutes in the syrup then remove it, stick some edible silver and gold leaf (if using) and let the syrup dry. Once the khaja are totally dried store in an airtight container. Once again knead the dough for 2-3 minutes and divide the dough into 5 equal parts and make balls. Mix ghee and rice flour and make a paste. Roll each ball into very thin round sheet. Place one rolled chapati on the surface, brush a tiny amount of paste then place another sheet and again brush the ghee-flour paste. Repeat the process with the rest of the sheets. Then gently roll the sheets together into a tight log and cut it into 1/2" pieces. Then follow the same procedure as above. Disclaimer -Thank you Mahbir Saffron for sending us these products. I was sent Mahbir Saffron products for an unbiased review and not told or paid to write a positive review. All opinions are my own. Wow, this recipe is really beautiful. I'm intrigued by those saffron products, and saffron syrup for this treat sounds so good! And your photography is over the top gorgeous! Wow!! This has everything I love! I'm a saffron girl and sweets always make me happy! Can't wait to try your awesome recipe! And, I love your gorgeous photography! Same pinch, I too love saffron and sweets :) Thanks for your lovely comment. this recipe is gorgeous!!! I love the colour of the saffron, must admit I never use it in cooking but the colour that comes from it is so beautiful! this dish looks like such a yummy dessert! This looks so incredibly delicious! It looks like the perfect dessert! I love saffron and wouldn't have thought to put it in a sweet! Those khajas are absolutely gorgeous. How pretty and flaky those khajas looks. Omg i cant take my eyes from your clicks. Seriously my mouth is watering here. With those saffron addition, am sure this khajas looks very rich and highly irresistible. Delicious and flaavourful khaja.. must try them sometime. Wow ! Seriously, I can't take my eyes off from these lovely clicks... Every time, I visit your page.. your clicks make me drool ! Awesome ! What a gorgeous post Jagruti. I also love to use Saffron in my dishes. Loved your click. These remind me famous khaja of Rajgir, Bihar. My mom usually made khaja with rice flour and ghee paste. You made me nostalgic. Awesome share. Khaja is my all time favourite , and looking at these I am literally drooling right now, just too tempting. 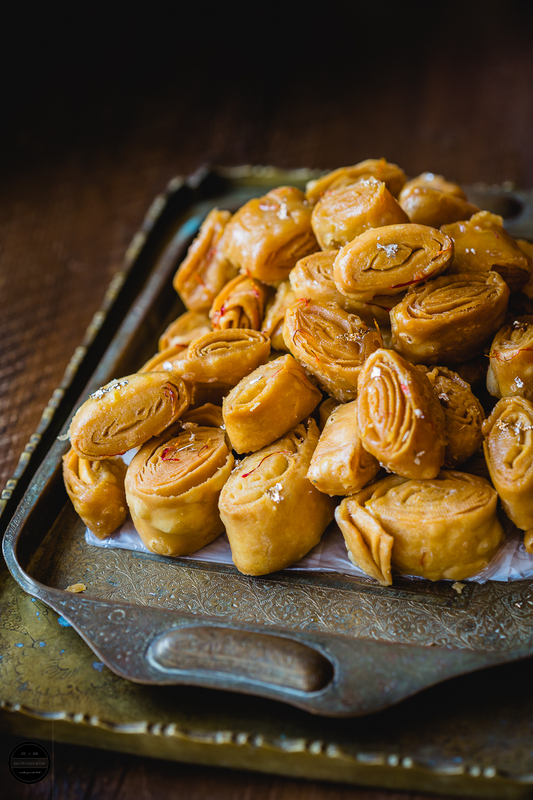 We call this snack as "madakku", which literally means folded, but in HD's place, they do call it khaja! :) Lovely inception of saffron into this snack... always addictive... beautiful clicks! As I was reading the post I thought I could smell the saffron. I too love using saffron. Its said that Kashmiri saffron is the best. Kesar khajas look so rich and royal. Thanks Mayuri, yes my dad used to say this as well that Kashmiri apple and saffron are the best! Layers upon layers of pastry soaked in aromatic sweet syrup - that's a dessert fit for kings and queens 😍😋 Your clicks are breathtaking beautiful, Jagruti! 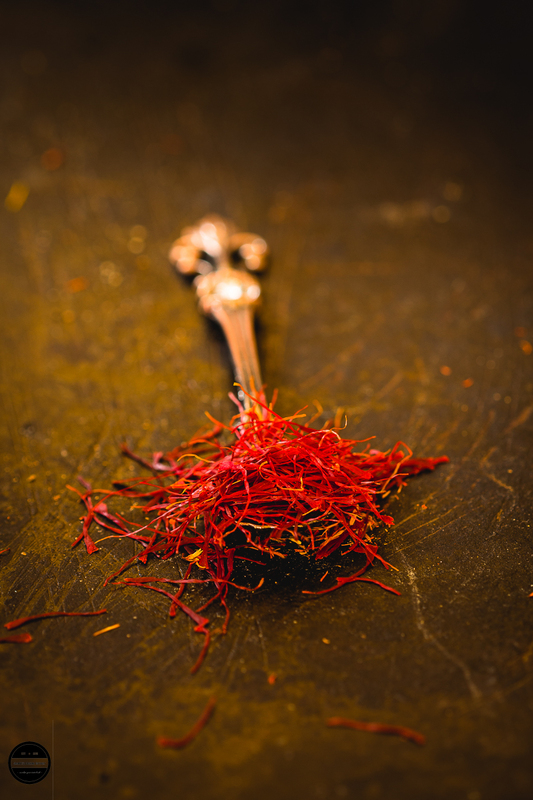 Saffron is my favorite to add in Indian sweets and it can make any desert fell and taste royal. Lovely you get the samples of best Kashmiri saffron. The kesar khaja looks absolutely tempting and inviting. But she never tried with saffron. I ll share your recipe with her. Thank you! Khaja looks awesome and addition of saffron has taken it to another level.